Home/Articles, Healing & Psychology, Spirituality/What is Spiritual Health? ‘You can’t judge a book by looking at the cover,’ sang rock n’ roll pioneer, Bo Diddley. These words were acutely relevant to me when I was a young man learning yoga and simultaneously working with the severely disabled. On one side of my life there were these toned, flexible and vibrant yoga teachers. On the other were teenagers and young adults confined to wheelchairs, bodies crunched up and completely dependent on the physical help of others. But which of these two groups enjoyed spiritual health? Thirty years on and I am leading a team pioneering the first mainstream vocational qualification in spirituality and health. Its development, as you can imagine, has involved long discussions about the nature of spirituality and health. We have also had to anchor it all down into a coherent language that could be approved by the government education watchdog, Ofqual. Our working definition of good healthdescribes it is as a state of comfort and flexibility, which applies to our physical and mental wellbeing as well as to our spiritual selves. Bad health is the opposite. Pain and rigidity. Movement hurts. Nothing flows. What is particularly interesting here is that we can be physically flexible, but hurting mentally and spiritually. Equally we can be spiritually strong and physically weak. In Taoist philosophy, authentic good health is to be in harmony with the benevolent flow of the universe. So our physical bodies can be wrecked – but our spiritual and mental health can be fantastic. But what on earth do we actually mean by spirituality? I like to encourage people to develop their own definition of spirituality. What’s yours? Working in an educational charity we have had to clarify and articulate our own stance. After much consultation we drafted a definition that seems to work for most people regardless of their beliefs. Spirituality is everyone’s natural connection with the wonder and energy of life. We also had to clarify and explain the meaning of spiritual health. For this we identified three crucial elements: connection, peace of mindand compassionate care. When assessing my own spiritual health these are the crucial issues. Am I connected? Do I have peace of mind? Am I caring and compassionate?Those questions apply whether we are in a wheelchair or teaching yoga. It is worth repeating, isn’t it? The first of the crucial elements of spiritual health: Are you connected to the wonder and energy of life? 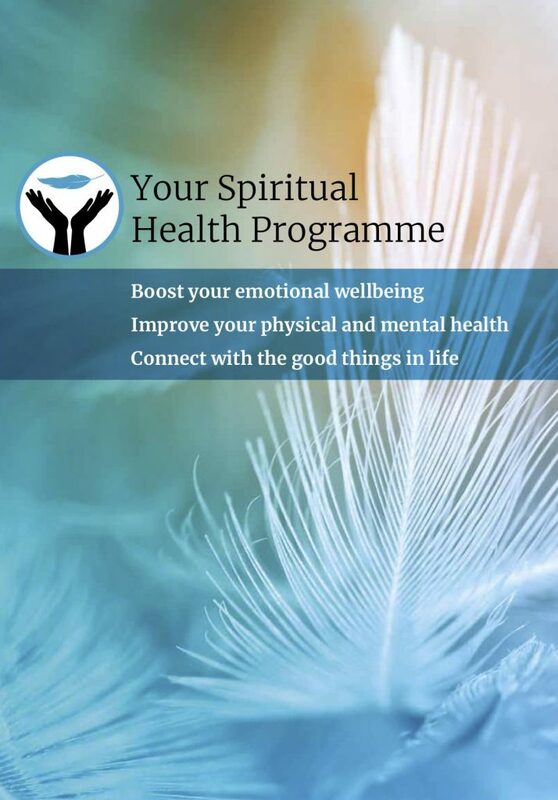 In the new Your Spiritual Health Programme, readers are guided through a series of questions to help them discover how best they make this spiritual connection. People have so many different ways. Yoga. Reading. Nature. Art. Caring. Worship. Song. Sport. Cooking. Meditation. And so on. Then when people have identified what circumstances and activities work best for them, they are guided to practice them regularly. Through mindfulness, grounding and breath they are supported in deepening the experience and fully enjoying it. For many yoga practitioners that happens at the end of a session, in corpse pose just lying there, soaking in the deep connection. Spiritual peace of mind is not apathy, or a relaxation exercise, or a brain wave state. It arises from a deep and wise way of looking at life. This wise attitude guides us to take regular reflective pauses. In these mindful pauses we observe and monitor our lives with detached good humour and compassion. We recognise that all our circumstances and experiences – good and bad, health, illness, success, failure, loneliness, community – are always opportunities to develop love and consciousness. This development of love and consciousness is surely the true purpose of our lives. Understanding this brings us meaning and coherence, a deep calm. The third foundation of spiritual health is compassionate care or love in action. If we are not actively caring we block the harmonious flow of the natural world, causing congestion for others and ourselves. Energetically, being compassionate pays forward the good energy we receive from being connected and having peace of mind. Selfishness, egoism, narcissism are all prime symptoms of spiritual bad health. Fortunately Mother Nature has evolved us very shrewdly. When we give care our endocrine systems are stimulated in a positive and beneficial way, relaxing tissue. Doing good, feels good. The wonderful thing about spiritual health is that we are not dependent upon anyone else for our ‘medicine’. We also always have access to a wonderful doctor who knows us better than anyone else, our own consciousness. So my fellow doctors, shall we all look at the state of our spiritual health? I love your work but would like to add another aspect to the above…In touch with your healing breathe. I tend to shallow breathe and even hyperventilate if I feel ‘threatened’. I cannot get over the affect of becoming aware of ‘breath’ and of taking time to breathe properly. Of taking time to breathe in ‘Grace’. I love the whole notion of Spiritual Health. William responds: Yes Thank You, Michelle. Many people do indeed get anxious when asked to focus on their breath. In my meditation classes I reckon one in ten experience that. So I don’t ask people to focus on their breath. Just settle down and be at ease —— And then a symptom of being at ease is soft breathing. —- But supposing you have asthma or a cold then it would be finding a place of being at ease even with the illness. The body will eventually go there, in the same way that it eventually gets sleepy and falls asleep. But can’t happen if there is any trauma, anxiety or fear. — So thanks for reminding us, Michelle. Hi, I also love your work and have found it to be the most comprehensive, easily accessible and holistic way of learning (from your books) I have encountered. I have spent 30 years working with adults with a learning disability and through this experience have discovered joy, frustration, connection, irritation, fulfillment, dissatisfaction and above all, meaning. It has been an education for me and from me in that I have integrated yoga, nature, music, arts and crafts, cooking and many other creative pursuits into my daily working life and as part of my own life, learning and leisure. I am always encouraged by your kind and wise words. They bring me back home to myself when I am feeling dissociated from my heart and soul. You truly walk the walk and talk the talk. William: – Thank you for your kind words, Lou. Appreciated. Your work sounds wonderful and inspiring. Blessings!